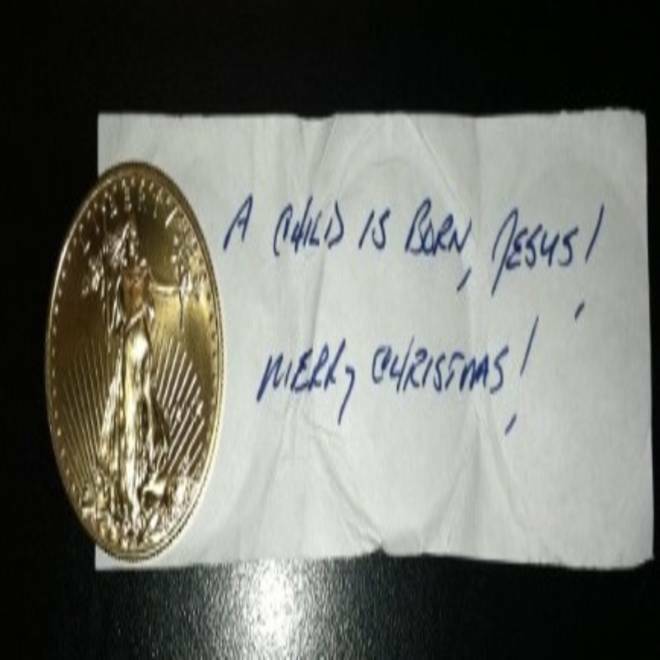 An anonymous donor left this gold coin worth almost $2,000 in a Red Kettle in Houston on Tuesday. Modern coins go "plink" when they drop into a Salvation Army kettle. But gold is a softer metal; it goes "plonk." And in a Christmas tradition that's 30 years old this year, the gold coins are once again starting to plonk into the iconic red kettles. It happened Nov. 9 in Bettendorf, Iowa, when a 1/4-ounce gold coin worth about $500 was dropped in a volunteer's pot outside Schnuck's Market. It was nestled in a cardboard setting with cellophane wrapped around it, so it stood out when the kettle was opened, said Holly Nomura, development director for the Salvation Army's Quad Cities Corps. Then on Tuesday, outside a Sam's Club in southwest Houston, someone — no one but the donor knows who — left a 1-ounce gold coin worth almost $2,000 in the pot, wrapped inside a $1 bill. Attached was this note: "A child is born, Jesus! Merry Christmas!" It's at least the 15th straight year that's happened in the Quad Cities and the fifth year in a row in Houston. And it's always "a wonderful start to our holiday fundraising efforts," said Lt. Josh McKain of the Salvation Army's Irvington, Texas, corps. The Red Kettle donation campaign began in San Francisco in 1891, and presumably gold coins — which were legal tender until 1933 — were part of the haul from the beginning. But the specific tradition of anonymously leaving a single gold coin in the pot is more recent. Most accounts say it began 30 years ago, in Quincy, Ill., but there's a friendly dispute over that — the Quad Cities unit in Iowa says it believes that the tradition began there, though it acknowledges it can't prove it. For years, someone would anonymously leave a single 1-ounce gold coin in a kettle in the Quad Cities (besides Bettendorf, the three other cities are Davenport, Iowa, and Rock Island and Moline, Ill.). That anonymous donor is believed to have died about four years ago, but not the tradition, as smaller gold coins have continued to pop up. "Every year we have one," Nomura told NBC News. U.S. Gold Eagles come in four denominations: $5, $10, $25 and $50. But their real value is tied to the market price of gold. A $10 piece like this one fetches about $500. The national Salvation Army says it's gotten more than 400 gold coins from anonymous donors over the last three decades. They come from several countries. Someone has left a South African Krugerrand in a pot in Mason City, Iowa, since 1997, for instance. 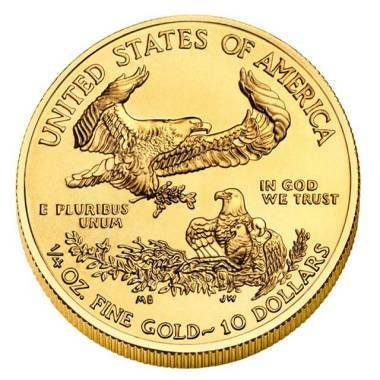 But they're often Gold Eagles, which are U.S. coins minted in four denominations: $5, $10, $25 and $50. They're 92 percent gold (and 3 percent silver), so their real worth fluctuates with the market price of gold. They're intended for collectors and for transactions involving precious metals, not for general circulation. The condition and age of a coin can lower (or raise) its final value, but the U.S. Mint said that at Thursday's gold price, a 2012 1-ounce $50 piece in uncirculated condition would cost $1,978. A 1/4-ounce $10 piece (like the one donated in Bettendorf) would command $515.50, the Mint said. Hoping to boost donations, Salvation Army bell ringers dance in the streets. NBC's Thomas Roberts reports. Obviously, you can't just throw one of those into a coin roll and drop it off at the bank. Eventually, the coin left in Bettendorf will be taken to a dealer to be appraised and then sold, with the proceeds going toward the chapter's $725,000 fundraising goal for 2012. Until then, it's in a safe, "except when the media wants to film it," Nomura told NBC News. And that's not uncommon — the tradition has turned into a terrific publicity tool for the Salvation Army. If a gold coin shows up in a kettle somewhere, a press release is sure to follow. But it also serves a larger purpose, said McKain, of the Texas chapter that got Tuesday's Gold Eagle. "It's not only a significant boost for us this year as a monetary donation, but also a huge motivation for all of our kettle workers," he told NBC station KPRC of Houston. "Really, for all of us who are involved in the Red Kettle campaign." NBC station KPRC of Houston contributed to this report.